During the great apocalypse, humanity fled to the depths of the underground enclaves. In genetic laboratories, researchers tried to breed a new being, splicing human and animal DNA, creating a beast intelligent yet strong enough to survive in the devastated world. The enclaves have fallen - but the animals’ fight for freedom has only just begun. Mutant: Genlab Alpha is a complete stand-alone expansion to the award-winning Mutant: Year Zero roleplaying game. Get ready for a furry mutant (r)evolution! A detailed description of Paradise Valley, the mountain valley where the animals are being held captive. The complete campaign Escape from Paradise, letting the players lead the animals’ fight for freedom. An overview of how the mutant animals can travel to the Zone if they escape, and join the human mutants of Mutant: Year Zero. 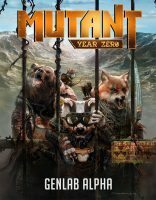 Add a Review for "Mutant: Year Zero: GenLab Alpha"